Judge Jeanine Pirro dropped a BOMB on her show Saturday night. 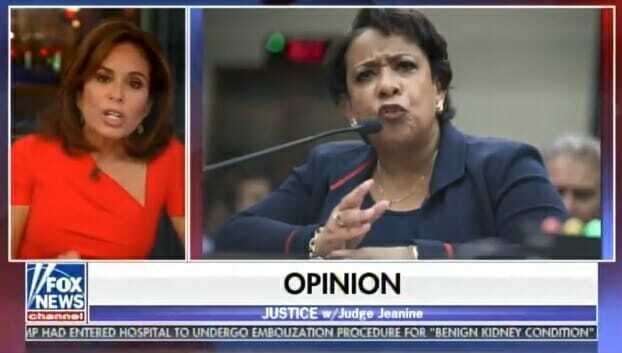 Judge Jeanine said former Attorney General Loretta Lynch must have signed off on approval for the FBI informant in London. This informant then spied on the Trump campaign and met with at least three Trump campaign advisers. Judge Jeanine: I want you to remember that you heard it here first. Any “collector,” their name for an informant working on a national campaign, must have a sign off by the Attorney General. Here that would be liar Loretta Lynch. Lynch, herself, would of have to have approved an informant on that campaign. And if she didn’t then the FBI under James Comey was even more corrupt, going rogue in their attempt to destroy Donald Trump.